Sara Campanella “Synthesis & Behaviour. Organism and Selection in Macroevolutionary Transformation” (February, 26th 2015). Giulia Frezza “Il gene: l’atomo = la genetica: la fisica? T.H. Morgan e il “fly group” (February, 12th 2015). Stefano Gensini, Francesco Ferretti, Fabio Di Vincenzo, Gesti, segni, parole. Evoluzione dei linguaggi, discussant L. D. Di Paolo, D.A. 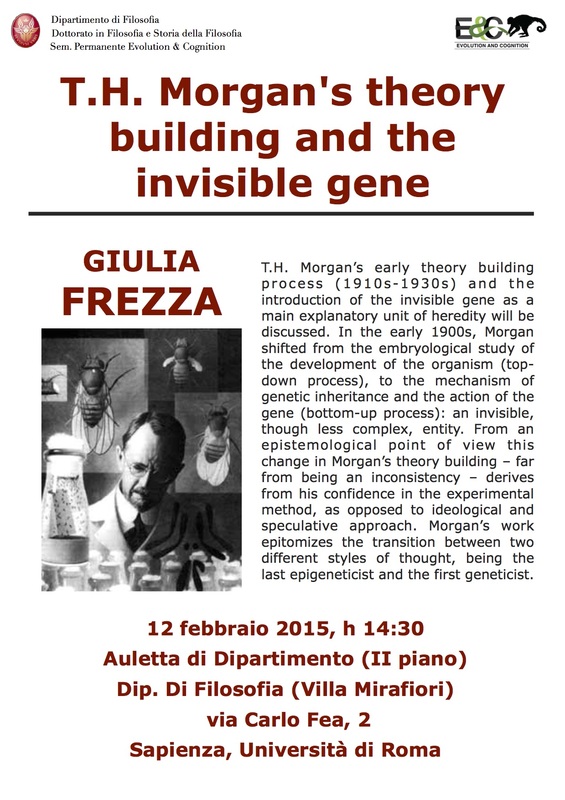 De Simone & J. D’Alonzo, 29th January 2015, Department of Philosophy, “Sapienza” University of Rome. Jacopo D’Alonzo, A Physiology of Language: J.G. Herder, 15th January 2015, Department of Philosophy, “Sapienza” University of Rome. David Ceccarelli, Scienza, religione e società nel Lamrkismo americano, 11th December 2014, Department of Philosophy, “Sapienza” University of Rome. Luca Tonetti, Un tentativo di riforma della medicina alla fine del Seicento: Giorgio Baglivi e il “De praxi medica” (1696), 4th December 2014, Department of Philosophy, “Sapienza” University of Rome. Massimiliano Napoli, Narratività ed esperienza, un approccio semiocognitivo, 27th November 2014, Department of Philosophy, “Sapienza” University of Rome. Nicole Cilia, The Topographic Brain: relazione spaziale e mapping analogico, 20th November 2014, Department of Philosophy, “Sapienza” University of Rome. Diego Antonio De Simone, A Theoretical Framework for the Evolution of Analogical Reasoning, 20th November 2014, Department of Philosophy, “Sapienza” University of Rome. Carere,C. – I modelli animali nelle scienze cognitive: la personalità animale, Thursday, 29th May 2014, Department of Philosophy, “Sapienza” University of Rome. Vitale, A. – Sperimentazione animale: un problema multi-dimensionale, presented by Simone Pollo, Thursday, 22nd May 2014, Department of Philosophy, “Sapienza” University of Rome. Morganti, F. – The Evolution of Mind and the Problem of Realism: Herbert Spencer. Di Vincenzo,F. ; Di Paolo, L.D. ; De Simone, D.A. – Precision and flexibility in generative procedures. Learning language and tool-making. De Simone, D. A.- A model for the acquisition of abstract concepts. Between epistemology and experiments. Raimondi, A. – Teleological explanation as a scientific explanation. Fabris, F. et al. – Beyond Waddington’s Epigenetic: epistemological problems and current research perspectives. All contents are licensed under a Creative Commons Attribution-ShareAlike 3.0 Unported License.